The artist group Augenstern (Christiane Prehn and Wolfgang Meyer) have lived and worked on the ship Anuschka for many years. 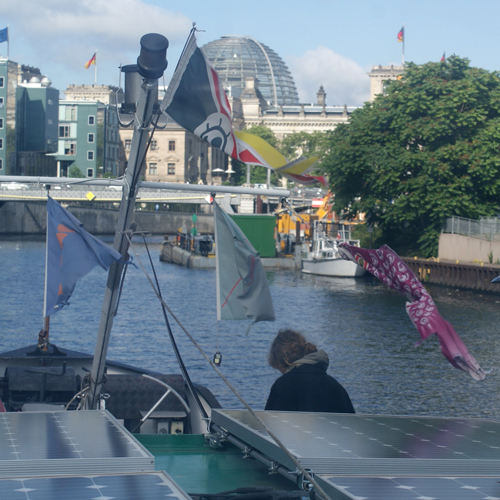 In July 2014 the MS Anuschka left Berlin in the direction of Paris before reaching their final destination in the south of France in November 2014. 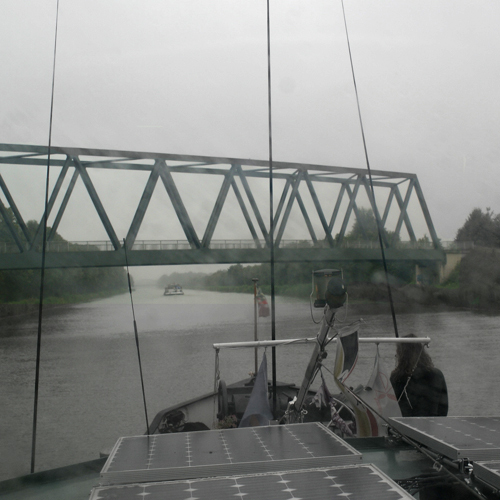 On the way, the crew examined numerous bridges, spanning rivers and canals. Using tentacles installed on board to scratch the bridges, the ship turned into a sensitive, perceiving and sounding laboratory interacting with the territory. Each of the bridges passed has its personal soundprofile, created by its shape, its practical use and its way of construction. During the journey KG Augenstern presented audiovisual performances that could be observed and heard along the banks. 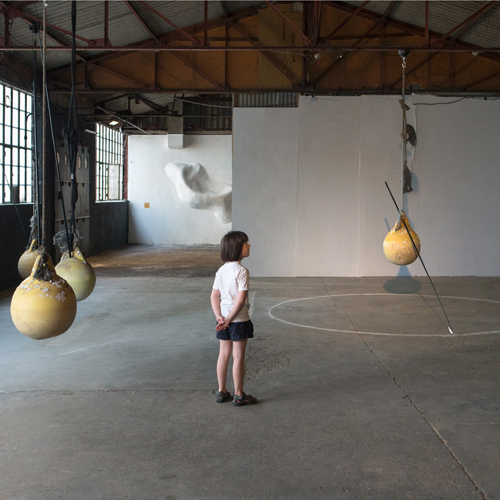 Exhibitions of “Tentacles”- installations where shown in contemporary art spaces at Arles and Valence. A complete documentation of the sound recordings can be heard on the SoundWays application. Crossing busy Berlin on a windy day, we navigated the Spree and Havel. 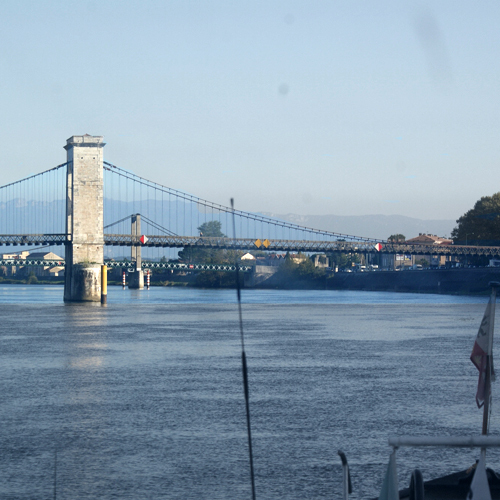 There are 30 bridges from the east to the western city boundaries and their height just permits our boat to pass. Unfortunately one of the bridges turned out to be too low because of the high water level. So, instead of scratching it with the tentacles, we scratched it with our top-tent, which lead to a long cut that had to be repaired later that day (You can hear that). In the very beginning, you hear the sounds of our mooring place in Berlin-Rummelsburg. On the way between Berlin and River Rhine, we traveled on the Havel River and most of the time on the Mittellandkanal, which is quite boring and has a lot of commercial traffic. We passed Hannover and Münster with its 7 bridges at the Dortmund-Ems Kanal, and then took the River Rhine in the direction north with its very high bridges, which our tentacles couldn’t reach. 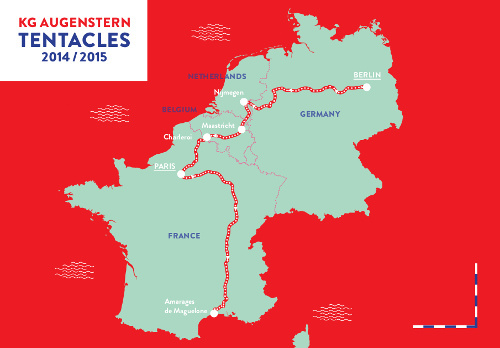 We turned south, up the river Maas through Maastricht, Namur and on the river Sambre to Charleroi in Belgium. 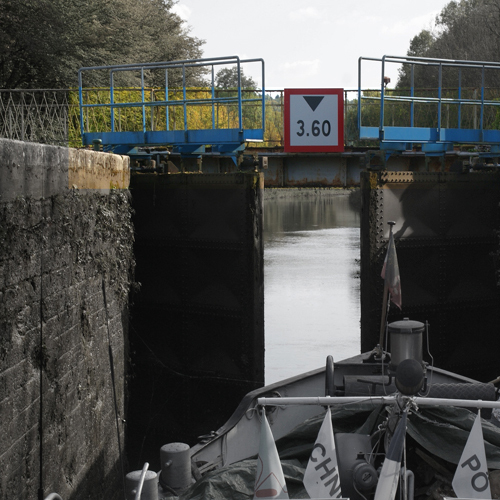 Our initial plan was, to travel further on the Sambre didn’t work because some locks where closed for reconstruction. So we continued on numerous canals reaching France on the river Schelde. From there we took the Canal du Nord (where we had another scratch-cut in the top tent because one bridge was lower than indicated) and the river Oise arriving on the Seine only a short distance left to Paris. We travelled the Marne River and its canal upstream where we had quite rainy weather. To be able to undergo the very low bridges of the Canal entre Champagne et Bourgogne we had to put down the top tent and steer under open sky for some days. 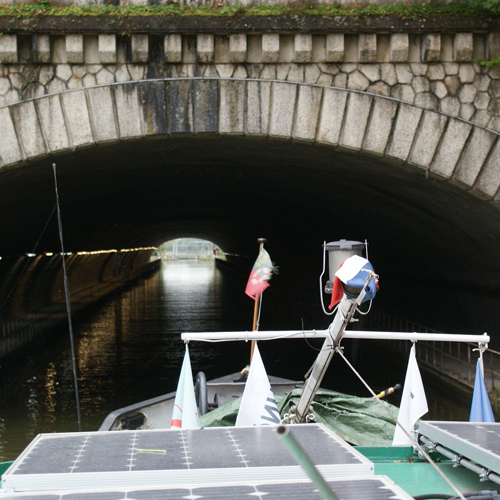 The canal is very narrow and in some parts very muddy which only allows low speed and makes steering quite hard. 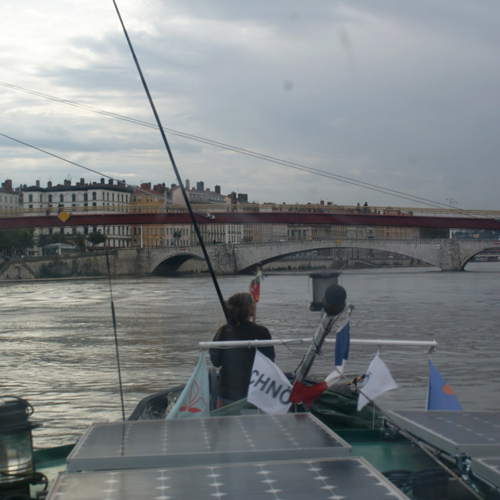 Additionally there are up to twenty locks to pass every day … so we where quite happy to be back on the rivers on the Saône which brought us to Lyon. We passed the ten bridges of central Lyon having quite nice weather. The big Rhône River took us south very fast with the help of the current. Bridges are high there because the water level alternates some meters depending on the weather. Near Arles we entered the little Rhône and the Canal entre Rhone et Sète. At the very end you can hear the sound of our winter mooring place at 6 am with different birds including flamingos. All the tentacles that where used are installed on a bottle dryer. All the sounds of the bridges are played together as a cluster. Stimulated by speakers, the noise of the cluster makes the tentacles tremble. Seven buoys discovered on the beach of the Mediterranean are suspended on rotating electric motors. At each of the buoys a tentacle is attached, which comes repeatedly to the limits of its field of action and then, scratches at walls at the floor or the ceiling. The produced sounds and rhythms vary according to the room. The installation turns with the slow precision of a clockwork. Through a fl exible suspension with roaps, the movements and sounds are still in permanent, randomly change. Materials, structure, shape and acoustics of the room are auditively and visually transformed in a permanent process. The application SoundWays changes life into a cinematic experience, providing a portable facility with the latest technologies of electro acoustic music and sound recording. SoundWays is an audio platform dedicated to the creating, editing and sharing of geolocalized sound walks. Soundways of ers to the user the possibility of unedited along the way environment related listening, of orientation and geolocalisation: a psychoacoustic in-vivo experience of theenvironment and the territory. SoundWays allows the professional and the non-professional user to create and share soundtracks of the daily life. 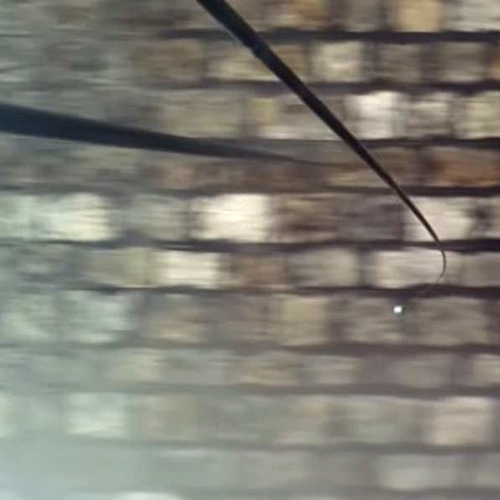 While depositing murmurs, bubbles of geolocalized sounds, and while reading those bubbles creating audio walks, the user of SoundWays gives sound to the space he explores. “Tentacles“ has its proper channel in SoundWays. 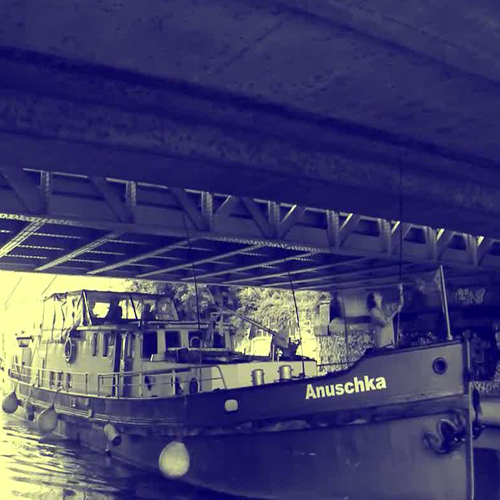 Christiane Prehn e Wolfgang Meyer – aka KG Augenstern – have transformed a Anuschka ship into a traveling sound laboratory. In July 2014, the ship set sail from Berlin in the direction of France. On the way the ship encountered bridges of different kinds running across rivers and canals. They devised special tentacles consisting of long metal arms installed on board the ship in order to be able to scratch the bridges, revealing sound profiles created by their shapes and contours. 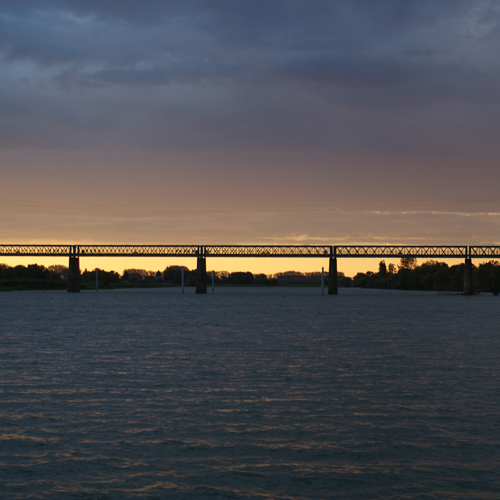 The result of this unique sound research – which reflected the shape of the bridges, their practical use and their type of construction – have been presented in audio-visual performances throughout the journey, in specially chosen places along the banks of the river. The tentacles concept – as an extension of the same listening skills of the field recordists – recurs in all the duo’s work that has implemented this approach. 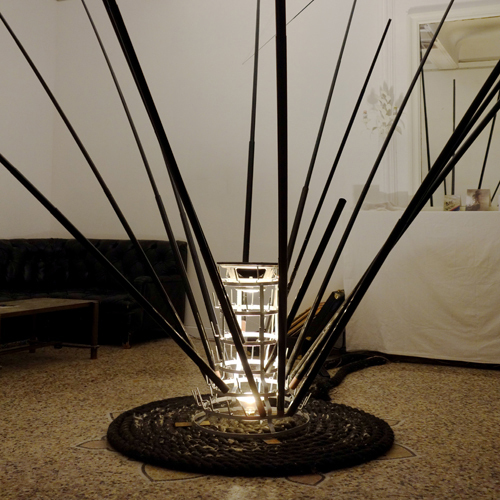 It also features in fixed installations on the theme of scratching and structural tension, static and dynamic. These experiments are presented in the last two tracks: “Tentacles Synthesis” and “Tentacles 2”, made at Galerie Huit in Arles, and in Valence, in a specially adapted warehouse. It’s precisely these fluvial tracks that are the most interesting and rich in suggestion. Of particular note is the track dedicated to Berlin, crossing the metropolis on a windy day, navigating the Spree and Havel, along 30 bridges from the eastern to the western city boundaries, recording atmospheres in locations imbued by natural elements and background noises coming from the surrounding streets, creating a tactile sound, almost sculptural in its frictional effects, which always return to spaces and architectures. The sounds are literally scraped from the surface but also diluted in the flow of the narration that of each crossing. Tentacles brings together a selection of bridge based field recordings made on rivers & canals between Berlin and North-East France. The release comes in the form CD, and 44 page colour booklet from respected German field recording/ sound-art label Gruenrekoder. The release charts a series of journeys made between July 2014 & November 2014 on the MS Anuschka traveling from France & Germany. 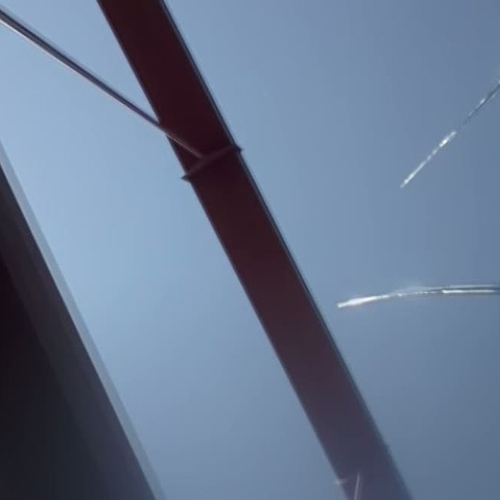 As the crew of sound-recordists went under different bridges, they used special installed metal tentacles to capture the sound profile of each structure they passed under it, as well as its surrounding sound environment. In all the disc takes in eight different recordings of these sonic profiles, and two shorter tracks from the resulting art installation connected to the project- with each track lasting between one minute forty & nearing thirteen minutes. As you’d imagine a fair bit of the release sonic terrority relies on all manner of scarpings, dragging, and rubbing textures. 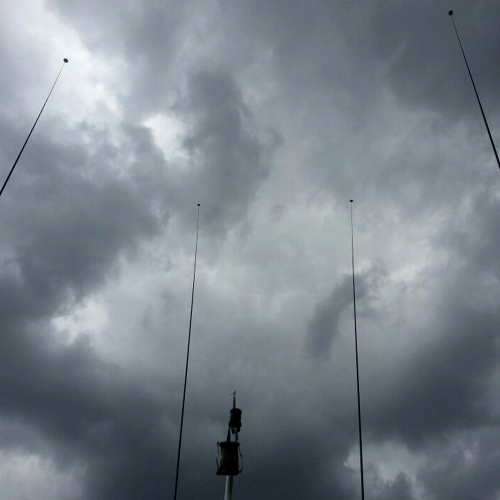 With a back drop of radio chatter, wind, various human & animal sounds, the water, distant roads, etc. Each location has its own sonic identity, though I did find a lot of the central elements captured by the tentacles are fairly similar. There’s little doubt that Gruenrekoder have done another Stella job on the packaging of the release- with colour pictures though-out showing snaps from the journey the boat took, as well as text detailing the project. And the idea of recording the sonic shapes of bridges or structures is fairly original & distinctive. But sadly I’m afraid to say on the whole the recordings themselves are rather samey, with not enough contrast between each to make Tentacles a wholly rewarding & captivating field recording release. Le ciel est triste hélas et j’ai mangé tous mes sous : pas de quoi faire un Bruxelles-Berlin… Heureusement il y a KG Augenstern (projet de Christiane Prehn and Wolfgang Meyer) qui me propose un Berlin-Amarages-de-Maguelone en passant par Charleroi à un prix défiant toute concurrence = celui d’une brochure qui sert d’étui à un CD. Prehn et Meyer ont fait tout ce voyage en bateau (le MS Anuschka) en 2014. Le couple a enregistré une partie de son périple (surtout des passages de ponts) en même temps qu’il prenait les photos reproduites dans la publication d’une quarantaine de pages. A Arles et à Valence (voir / entendre l’extrait ci-dessous), ils ont imaginé avec tout ça de premières installations. S’il n’était pas accompagné de sa brochure (et sans ses basses à vous décoller les enceintes du mur) j’aurais qualifié cette suite de field recordings d’étrange et d’anecdotique. Mais les photos et la description qui en est faite offre un plus non négligeable. Voguant au large d’Hanovre, de Paris ou de Lyon, le couple en profite pour nous montrer des coins de ciel et d’eau tous gris mais tous différents. Et cela ne tient pas qu’à l’architecture du pont, non : en tendant bien l’oreille on nous dit que leurs bruits sont propres aux uns et aux autres. Pour ce qui est des installations, elles ont de l’allure et donnent envie de s’approcher un peu plus encore de l’Anuschka. Gruenrekorder has not only repeatedly demonstrated a remarkable talent for identifying special artists and granting them an outlet by which to disseminate their works, the label also maximizes the impact such projects can have when they’re presented so elaborately. A clear case in point is Tentacles by Augenstern duo Christiane Prehn and Wolfgang Meyer, multi-dimensional sound artists who have lived and worked on the ship Anuschka for many years. 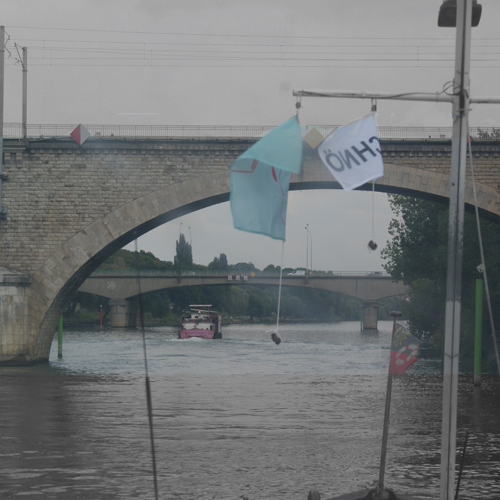 The album title isn’t as odd as it might first appear: the recording, which traces a five-month trip the two undertook in July 2014 from Berlin to the south of France, takes its title from ship-attached tentacles that scratched the bridges under which the duo traveled as they made their way through canals and rivers. 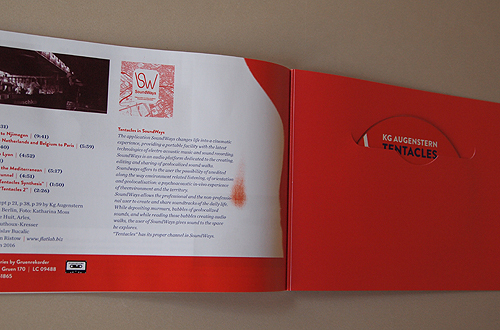 Tentacles, issued in a 500-copy edition as part of Gruenrekorder’s Field Recording Series, thus functions not only as an especially tactile aural diary of the journey but also a sound document that sensitizes the listener to the subtle differences in sound properties between one bridge and another. We begin at Augenstern’s mooring place in Berlin-Rummelsburg, where sounds of traffic, a barking dog, wind, rushing water, and the tentacles themselves, that when aggressively scraped generate a steely, rustling noise that’s rather alien-sounding, collectively establish a clear sense of place. Having passed through thirty bridges in the opening leg, the boat eventually enters The Netherlands by way of the Havel and Rhine rivers, loud scrapes marking the boat’s advance. Birds twitter, dogs bark, voices murmur, and a saxophonist practices scales as the ship makes its slow passage across hundreds of kilometres. 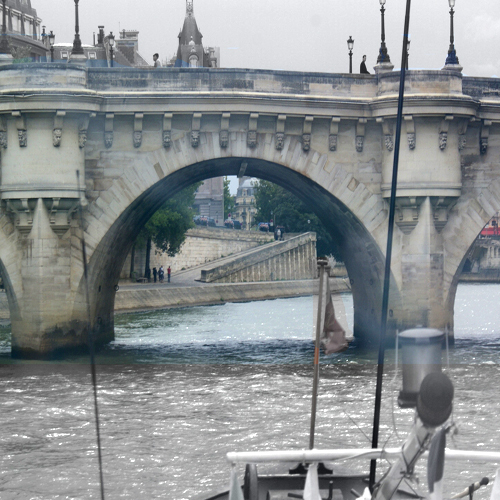 Eventually, the duo reaches La Vilette in central Paris, witnesses the familiar sights of the Seine and its famous bridges (Pont Royal, Pont Neuf, etc. ), and moves on to Lyon and the Mediterranean until the Anuschka reaches its winter mooring place, its 2450 Km journey now completed. What makes Tentacles extra special is the deluxe manner by which it’s presented. 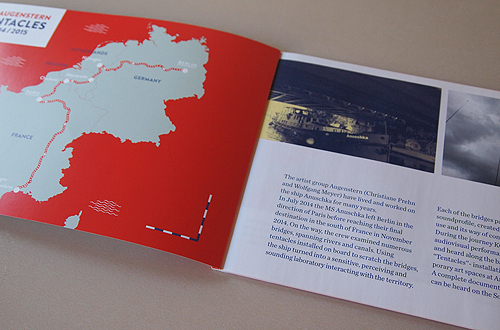 To complement the CD’s sound files, a full-colour, forty-four-page booklet containing photos, text, and maps provides a fascinating amount of context for the project. Separately indexed tracks document the journey’s stages, the sum-total of which is supplemented at disc’s end by two short installation-styled pieces. The cartographic images are attractively designed, and the photo images and text details provide excellent support. Marring the presentation slightly are a few instances where ‘where‘ is mistakenly used for ‘were,‘ but the error is not so severe that it undermines the project; in a perfect world, another edition of the project would see the flaw corrected. It’s a fascinating and engrossing project, that small misstep notwithstanding. Christiane Prehn & Wolfgang Meyer sind zusammen KG AUGENSTERN. Mit Tentacles (Gruen 170, Fotoalbum + CD) laden sie ein zu einer Flussfahrt, die sie mit ihrem MS Anuschka durch Europas Geäder führte: Via Spree – Havel – Mittellandkanal – Dortmund-Ems-Kanal – Rhein – Maas – Sambre – Schelde – Canal du Nord – Oise – Seine – Canal de L’Ourcq – Marne – Marne- Saône-Kanal – Saône – Rhône – Rhône-Sète-Kanal von Berlin über Hannover, Münster, Njimegen, Maastrich, Charleroi, Paris, Valence, Lyon und Arles bis Maguelone, über 2450 km! Der namensgebende Clou bestand darin, ‚Fühler‘ auszufahren, um die durchfahrenen Brücken zu streicheln und als kratzige und klappernde Percussion mitsamt Flussfahrtatmosphäre hörbar zu machen. 30 Brücken in Berlin, 10 in Lyon und die Gelegenheit, über „Die französische Kunst des Krieges“ nachzusinnen. Durch Eisen und Stein hindurch, durch Stadt und Land, die Pont Neuf knutschend, den Balesmes-Tunnel und die Pont d’Avignon. Kurioses Wischiwaschi? Oder den psycho-akustischen Kontakt suchende Konzeptkunst, die mit markantem Schliff eine sinnliche Wahrnehmung von bewegter Ortserkundung verschafft? Gipfelnd in zwei Installationen des Tentakel-Prinzips, als Tentakelcluster auf einem duchampschen Flaschentrocker und mit einem Tentakel-scratching mit sieben wie für Riesenhammerwerfer aufgehängten Bojen. 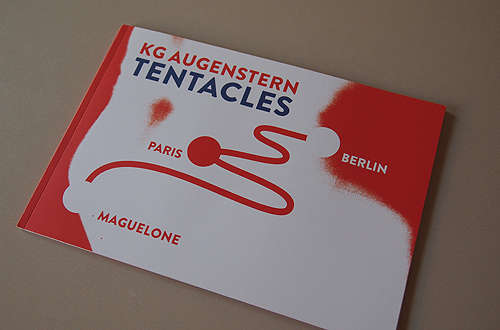 Kg Augenstern’s “Tentacles” is the embodiment of tactile sound. Utilizing space as an artifact of sound the pieces represent their unique geography. Like a wordless travelog the songs have love for their surroundings, exploring them in a myriad number of ways. The mixture of the calm and the chaotic works wonders for the sound as it feels positively alive with meaning. Over the course of the album Kg Augenstern lets each of these different locations show off a distinct personality. Starting things off on a mellow note is the spaciousness of “Berlin”. On this piece the transitions feel light and airy as the sound itself is one that is impossible to fully pin down. Far busier is “from Berlin to Njimegen” where the elements of the natural world filter in far more gradually, with the radio transmissions adding to the heightened sense of reality. Exploring the joy of the drone is “Paris”. Ambitious and sprawling the piece incorporates everything from simple movement to the highly detailed layered sounds that blanket themselves over the world. By letting the song unfurl slowly it serves as the highlight of the album. Opting for a confrontational sort of release is the intense noisiness of “Tentacles Synthesis”. Letting the environment swallow everything up results in a maddening sea of sound from which there is no escape. Bringing the album to a soothing introspective close are the micro sounds of “Tentacles 2”. 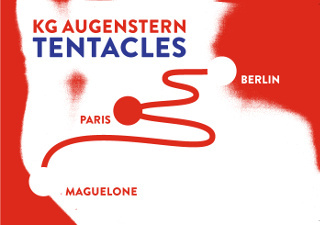 Mindfulness reigns over the contemplative performance of Kg Augenstern’s “Tentacles”. Niemieccy artyści wybrali się w podróż statkiem z Berlina do Francji. Po drodze pokonali wiele mostów i w trakcie ich mijania zarejestrowali różne odgłosy. Christiane Prehn i Wolfgang Meyer tworzą duet o nazwie Kg Augenstern. Oboje działają w obszarze audiowizualnych/audiokinetycznych instalacji, performance’u, sztuki wideo, soundartu i filmu. Przez wiele lat żyli i pracowali na statku Anuschka. W lipcu 2014 roku artyści wypłynęli z Berlina w kierunku Paryża, lecz miejscem docelowym ich wyprawy była miejscowość Maguelone na południu Francji (dotarli tam w listopadzie 2014). Płynąc różnymi rzekami mijali wiele mostów i kanałów. Postanowili, iż będą nagrywać dźwięki otoczenia w momencie kiedy ich statek wpłynie pod most/kanał. Załoga Anuschki każdorazowo wchodziła w interakcję z danym obiektem, którego architektura pozwalała im uzyskać i następnie zarejestrować wyjątkową przestrzeń dźwiękową. Zebrany przez nich materiał posłużył do przygotowania wystawy audiowizualnej pt. „Tentacles”, którą później zaprezentowali w dwóch francuskich galeriach w Arles i Valence. Wytwórnia Gruenrekorder opublikowała bardzo ładnie wydany album „Tentacles” (CD+książka). W dołączonej 42-stronicowej książeczce mamy zdjęcia, opisy i mapki z poszczególnych odcinków trasy ich podróży. Jak już wspomniałem, wypłynęli w wietrzny dzień z Berlina – na tym etapie jeden z mostków okazała się zbyt niski, ze względu na wysoki poziom wody. Tak więc doszło do drobnej awarii, ale szybko ją naprawiono. Płynąc Renem ku miastu we wschodniej Holandii Nijmegen, zahaczyli o Münster i Hannower. Następnie Mozą i Skaldą dotarli do Belgii, a stamtąd Sekwaną do Paryża, gdzie ich tak zwane „macki” (wyglądają trochę jak wędki zakończone czujnikami w postaci mikrofonów, który ocierały się o ściany np. mostu) nagrały odgłosy dochodzące m.in. spod Canal de L’Ourcq. W trakcie opuszczania francuskiej stolicy ich profesjonalny mikrofon wpadł do rzeki i musieli wspomagać się telefonem komórkowym. Następnie rzekami Marną i Saoną przedostali się do Lyonu. W centrum tego miasta minęli dziesięć mostów. Później wpłynęli na dużą rzekę Rodan, która doprowadziła Prehnę i Meyera do celu. W pobliżu Arles skupili się na odgłosach, jakie ich rejestratory wyłapały tuż pod Canal entre Rhone et Sète. Dwie ostatnie ścieżki wydawnictwa „Tentacles” są drobnymi wycinkami dwóch instalacji: „Tentacles Synthesis” (Arles, kwiecień 2015) i „Tentacles 2” (Valence, czerwiec 2015). W przygotowaniu tej drugiej instalacji posłużyły boje znalezione na jednej z plaż Morza Śródziemnego. Warstwę dźwiękową, jaką znajdziemy na albumie „Tentacles” ciężko jest zestawić z czymkolwiek, jej charakter sprawia, iż obcujemy z czymś w rodzaju odrealnionej, wyizolowanej (pomijając odgłosy ptaków, aut, fragmenty rozmów) strefy psychoakustycznych wrażeń dźwiękowych silnie rezonujących z percepcją słuchacza. Following last weeks lavish dark book by Mikel R/ Nieto, there is now another oversized CD booklet (15 x 23 centimetre), 44 pages of text and colour photos of a project carried out by KG Augenstern, a duo of Christiane Prehn and Wolfgang Meyer. They have a boat, the MS Anuschka and they motorshipped their way from Berlin to Amarages de Maguelone, which is all the way down south in France. On the ship they made tentacles to scratch the bridges, under which they passed to there. All along they also took pictures and all of that resulted in installation pieces in Arles and Valence. The fun for Vital Weekly is that they passed by our sunny town also, as documented on the second piece ‚From Berlin to Nijmegen (NL)‘. Had I just played the CD and not read the book or looked at the pictures, I think all of this would have eluded me. I am not sure what I would have made of this then, anyway. Obviously I know about the story, so one never knows what else I would have been thinking. One hears a bit of water sounds all along this, and scraping: yes that seems to be part of this anyway, along with motor sounds from the vessel itself. It sounds all quite ‚pure‘, without much alternation or processing afterwards. In each of the separate tracks there are starts and stops to be noted, meaning, I gather, these are individual sounds captured on that particular part of the route; all pieces are noted by their part thereof. It is all quite a fascinating release, completely in line with Gruenrekorder usual policy of pure field recordings. Very captivating, even if one is, like me, afraid of boats. In der letzten Gruenrekorder-Kolumne war ja bereits die Rede davon, dass man ziemlich herum kommt mit den Ohren, wenn man sich mit den CDs des Labels beschäftigt, und das war natürlich ausschließlich positiv gemeint. Die Aufnahmen, die Gruenrekorder veröffentlicht, werden ansprechend präsentiert und sind ein Abenteuer für die Ohren. So auch dieses Mal. Namen wie Ruddy Kingfisher tragen! Es zirpt Tag und Nacht, und noch viele andere Geräusche dringen aus dem Urwald ans Ohr. Wie immer atemberaubend, spannend und entspannend. Noch relaxter geht es bei HAFIS BJARNADÓTTIR zu, deren Sounds Of Iceland überraschend reduziert rüberkommen. Es plätschert, taut, blubbert, rauscht und kocht – je nachdem ob das Mikrophon vor Bäche, Gletscher, heiße Quellen, Wasserfälle oder Lavaströme gehalten wurde. Wasser, Gezeiten, Naturgewalten und gigantische Naturschauspiele, die überraschend intime Sounds generieren. Trotzdem wird es beizeiten recht kalt oder heiß gewesen sein, wobei es sich in angemessener Funktionskleidung sicher neben dem Mikrophon hat aushalten lassen. Die Aufnahmen selbst machen wenig frösteln, im Gegenteil, sie wärmen eher – auch wenn einem der Wind um die Ohren bzw. aus den Kopfhörern pfeift. Großes Kopfkino liefert auch, man mag es nicht meinen, der Rhein. Es muss nicht immer Island sein, Karlsruhe hat es auch in sich. Das Duo RHEIN _ STROM bestehend aus Lasse-Marc Riek (Aufnahmen) und Thomas M. Siefert (Location Scout), dokumentiert den Klang des Rheines und seiner nahen Umgebung Von der Rheinquelle bis Hafen Karlsruhe auf der ebenso benannten CD. Das sind ein paar Hundert Kilometer, festgehalten in 21 Ausschnitten. Und – im Unterschied zur zivilisationsfernen Wildnis einer tropischen Insel oder der relativen Unberührtheit Islands – um den Rhein herum menschelt es, Flugzeuge überfliegen den Fluss und Schiffe befahren ihn, Autos und Züge begleiten ihn. Auch das hört man. Und so stellt das Booklet zur CD die Frage: »Wie können wir als heutige Menschen zu diesem Fluss in Beziehung treten, ohne in der Begegnung mit seiner an manchen Stellen erhaltenen Schönheit wieder einem Romantizismus zu verfallen bzw. im Konfrontiertsein mit den irreparablen Eingriffen sich frustriert und desillusioniert abzuwenden?« Eine Audio-Aufnahme des Flusses und seiner nicht nur natürlichen Geräuschkulisse mag da einen weniger voreingenommenen Zugang gewähren. Der Rhein als Fluss und von Mensch und Maschine geformte und genutzte Ressource klingt hier und da wie eine elektro-akustische Komposition (im Hafen Karlsruhe etwa, wenn sich unter Wasser aufgenommene Schifffahrtsgeräusche in der Aufnahme wiederfinden). Das klingt alles recht spannend und wirft anregende mithin schwerwiegende Fragen auf, die nach Umweltschutz beispielsweise. Eine ökologische Frage, auch für die Ohren. Was muss man nicht alles hören, tagein tagaus! Und was will man nicht hören bzw. was hört man überhaupt, wenn es zirpt und raschelt? So harmlos geht es nicht zu, so unberührt ist die Natur nicht. Wie (drohende) Umweltverschmutzung als Field-Recording klingt, diese Erfahrung kann man sich am Beispiel von MIKEL R. NIETO und seinem Dark Sound eindrücklich vor Augen bzw. Ohren führen. Die Aufnahmen kommen zusammen mit einem pechschwarzen Buch und dokumentieren Naturaufnahmen aus dem Yasuni-Nationalpark in Equador, dessen indigene Bevölkerung und tierischer Artenreichtum durch Bohrungen nach einem Ölvorkommen tief unter dem Naturschutzgebiet nicht mehr nur bedroht ist – die Zerstörung und Vertreibung ist bereits in vollem Gange. So stellt sich beim Zuhören die Frage, ob der Tropenregen schon auf aufgewühlte Erde fällt, die von Rohöl verschmutzt ist, und es knattern auch die Fördermaschinen auf der CD, die dem schwarzen Buch beigelegt ist. Man könnte fragen, ob nicht mit dem schwarzen Buch (schwarzer Druck auf schwarzem Papier) der pädagogische Holzhammer herausgeholt wurde – andererseits entspricht das schwarze, beinahe unlesbare Buch in seinem Aussehen den ölverklebten Vögeln und Meerestieren, deren Bilder in Europa noch am ehesten mit Ölkatastrophen assoziiert werden, und insofern ist die Aufmachung genau passend. Dark Sound zeigt eindrücklich die politische und unbequeme Seite dessen, was Field-Recordings auch sein können. Ähnlich unheimlich auch die Aufnahmen von CHRISTINA KUBISCH / ECKEHARD GÜTHER , die auf Unter Grund Grubenwasser zu Gehör bringen, das sich in stillgelegten Untertagebauschächten sammelt und dort abgepumpt und umgeleitet werden muss, damit es das Trinkwasser in der Region nicht verunreinigt und den Grundwasserspiegel nicht derart anhebt, dass sich das Ruhrgebiet mit der Zeit in »eine riesige Sumpflandschaft« (so ein Zitat aus dem Beiheft zur CD) verwandelt. Langzeitfolgen des Kohlebergbaus, gruselig, hier nachzuhören. Verlassen wir diesen Horror und wenden uns noch kurz der Field-Recording basierten Klangkunst und Musik zu. KG AUGENSTERN sind per Kanalschifffahrt von Berlin bis Maguelone am Mittelmeer gelangt. Das scheint zu gehen und sie haben auf Tentacles ein Klangexperiment festgehalten, das sich wie folgt erklären lässt: Lange Stangen auf dem Kahn kitzelten bei jeder Durchfahrt unter einer Brücke deren Eisenkonstruktion und der dabei entstehende jeweils spezifische Sound wurde festgehalten und im Rahmen von Klanginstallationen in diversen Museen zugänglich gemacht. Das klingt aufwendig und phantasievoll, es scheppert auch ordentlich, aber auf der Reise stelle ich mir das Spektakel interessanter vor, als das konservierte Ergebnis klingt. Das je eigene Klangprofil der Brücken, von dem KG Augenstern im Booklet zur CD schreiben, es kommt nicht so recht rüber. Kommen wir zu DAVID ROTHENBERG / KORHAN EREL. Rothenberg hat ja schon mit Zikaden musiziert, und auf Berlin Bülbül spielt er zu Field-Recordings von Nachtigallen Klarinette. Das ist nach all dem Rauschen und den ökologisch katastrophalen Perspektiven je nach Geschmack läppisch oder erholsam. Es ist beides, lang lebe der Zwiespalt. 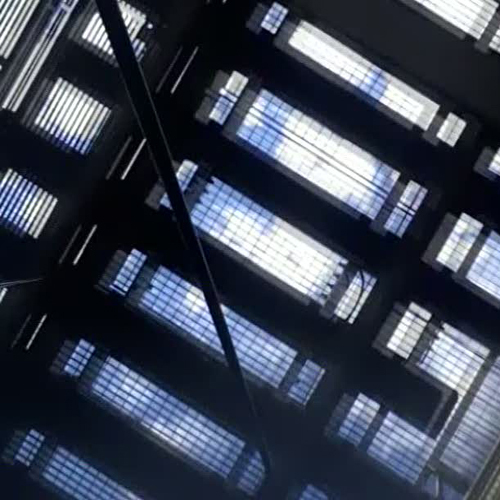 Ganz unzweideutig Nerven zerfetzend ist das Ergebnis von CLUB BLEU , die auf Dark- Asian- Energy Field-Recordings der Stadt Singapur elektronisch ergänzen, verfremden und bis zur Unkenntlichkeit verzerren. Heraus kommt dabei ein elektro-akustischer Höllenritt. Mir zu stressig, aber möglicherweise hervorragend geeignet, morgens statt mit Kaffee mit dieser Musik in die Gänge zu kommen. Lieber greife ich abschließend zu Sonic Drawings von ROLAND ETZIN , die CD liefert auch nicht gerade Easy-Listening, aber das Soundmaterial ist weniger chaotisch organisiert. Etzin kombiniert Field-Recordings unterschiedlicher Herkunft und verfremdet sie ebenfalls elektronisch. Das geht, um es mal etwas flapsig zu formulieren, bei ihm eher in Richtung Nurse With Wound und nicht – wie bei Club Bleu – in Richtung Atari Teenage Riot. Das mal als lahmer Vergleich zum Abschluss.